With a pristine locale that’s steps away from the Nags Head Fishing Pier, and deeded beach access located right across the street along the northern side of the white fence, Making Memories will be a truly memorable getaway for beach lovers. 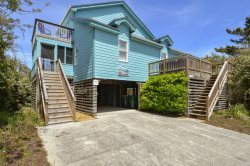 Boasting 5 bedrooms and 4 bathrooms, this little haven has all the amenities modern vacationers love, as well as a prime location that’s close to restaurants, shops, and those acclaimed Nags Head beaches. Guests can enjoy a daily splash in their own private pool, whip up a casual family feast at the nearby grill, or step inside to enjoy a family pool tournament in the recreation room with pool table, foosball table, and queen sleeper sofa. This level also features a convenient hall bath, as well as a cozy bedroom with a queen bed for effortless afternoon naps. Sweet dreams are easily achieved in the second level, where three well-appointed bedrooms are found. There’s a master bedroom with king bed, whirlpool tub and separate shower, a bedroom with queen bed and adjacent bath, and a bedroom with a pyramid bunk. A hot tub is found just steps away on the back deck, and guests can enjoy ample peace and quiet in the second level den with a wet bar and queen sleeper sofa. The top level is a gracious and spacious destination for post-beach relaxation, courtesy of a great room that features a comfy living area, an ample dining area, and a well-stocked kitchen. There’s also a master suite on this level with a king bed, whirlpool tub, and separate shower, as well as an expansive sun deck with picturesque ocean views. With everything under the sun a vacationer could need to enjoy the best of the beach, Making Memories is an inviting destination for family members of all ages and interests. Plan your great escape to the coast, and book your vacation at this elite retreat that is simply unforgettable. PRIVATE DEEDED BEACH ACCESS LOCATED ACROSS THE STREET ALONG THE NORTH SIDE OF THE WHITE FENCE. I like how you can see the rates for houses for the next year as well as houses that are already booked. This allows for planning for the future. Seaside was very easy to work with and did everything they were expected to do. The house we rented, Making Memories, was clean and on a great location. Our family had a great time.